With the constant increase of popularity of the GoPro, which is now hailed as one the best action cameras, used for filming sports and drone footage, a lot of companies are manifesting an increased interest in this market. While some action cameras offer a multitude of features, such as image stabilization, 360-degree video, 60fps 1080p video, 30fps 4K video, these features are reserved for more expensive products, and while they’re nice to have, for your average user, they might be a bit of an overkill. Let’s start talking about price: what product out there is going to give you the best bang for your buck? What product is going to give you an appropriate amount of features for a very reasonable price? We’re going to take a look at my Eken H9S Review – The H9S is a new version released by Eken. It’s an affordable action camera that comes with some of the high-end features everyone’s looking for. Unlike it’s predecessor the Eken H9, the H9S comes with better and more enhanced features. This is a good camera for people who are thinking about adding a bit of quality to their action videos to then share it to YouTube and other social media channels. Coupon expires on 16/11/2018 ! 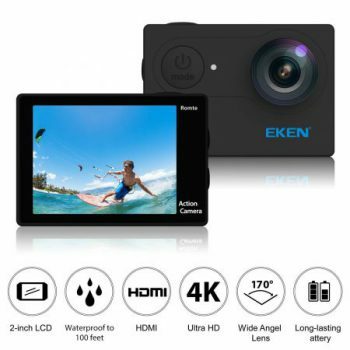 The Eken H9S Action camera comes in a bundle, together with 6 different mounts, two batteries, a tripod, a USB cable, two helmet mounts, a 2.4 G wireless camera control remote, which you can use to scroll through captures and settings, especially cool since this little guy has an HDMI output so you can feed live source or pre-recorded videos to a full-HD TV or other type of display, waterproof housing, protective backdoor AND camera clip. For the low price of USD 72.99, which can drop to an amazing USD 63.19 using this coupon code – ZO3HRXV9 – you’re getting a really great deal. With the two batteries, waterproof case and different mounts(including helmet and bike mounts), there are very few activities that you can’t use the H9S action camera for. Take it diving, biking, surfing, you name it. Before we talk about the features and quality of the video footage, this isn’t any high-end equipment, so try to judge it for what it is – and entry-level action camera. That being said, let’s look at how it fares when actually being put to use. Starting up with 720p 60fps recording, the H9S performs beautifully. The image is clear, although if you’re going to mount it on a bike or vehicle, make sure that it’s a tight fit, as the lack of image stabilization can make the video a bit shaky. Using a helmet mount, that problem disappears and you’ll have a pretty stable image. When it comes to colors, without any adjustments, it struggles a bit when changing lighting, and noise starts to appear in images where there are a lot of colors or contrast. In proper lighting and after adjusting the image settings a bit, it worked just fine. The 60fps didn’t dip and offered a very smooth viewing experience. Sound is a bit of an issue, to say the least. The low-end spectrum isn’t covered at all by the integrated mic and what you’ll be getting is just a mid and high recording of the events, which can get annoying to hear. Wind has a very negative impact on the sound quality, as it will make the audio recording unusable. This might not be as bad as it sounds, as most action-cameras focus on video recording, so feel free to edit the sound out and add some dynamic music on the background for that extra pizzazz. Filming in 1080p was very similar to the 720p recording, as the image was very clear in proper lighting and the 60fps delivered a smooth, pleasant-to-watch video. The same issues were present in this recording aswell, especially during nighttime. Although it doesn’t have any issues when filming streetlights or well-lit areas, it struggles to maintain a sharp image when a lot of contrast is added in the mixture. For example, filming at dawn, when the streetlights are on, you’ll see that noise finds its way on the image and it can even get a bit blurry, but after some adjustments, we found that it started to perform better, with clearer quality. 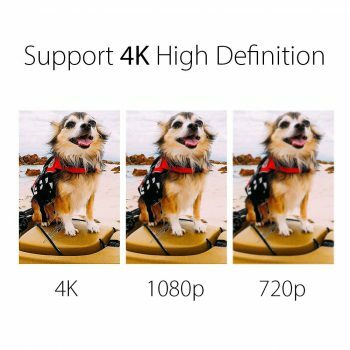 When filming in 4K, it doesn’t perform as expected. The frame rate was around 10 fps for the whole recording, so this can be an disappointing to some but let’s not forget that this camera only costs 63.19$(after the coupon). Using the waterproof case, you’ll find that, before submerging, it can smudge-up the image a bit, even after properly cleaning the plastic lens. You can remove the plastic around the lens if you don’t plan on going underwater, to add more watertightness to the camera when filming in rain. When submerged, there were no issues with smudging and it offered a very, very impressive performance when used at 1080p 60fps. The darker environment was no issue as there weren’t any sudden shifts in contrast and lighting, and it really does deliver great image quality in optimal conditions. In addition to that, the waterproof case is reliable and will keep your camera safe and functional, while still being able to fit all of its mounts. The Eken H9S also has a time-lapse feature, that you can set on different intervals, depending on the desired outcome, but it has its flaws. As with most of the footage, the problem is adjusting with the shifts in light. I strongly recommend that you use this camera with proper adjustments or, even better, on cloudy days, as the lack of shadows translates into very crisp and clear footage. The 170 degree super wide lens will give you a nice, complete picture, without any distortion around the edges, like a fish-eye lens, which is really great. The 12 megapixel camera will offer you pretty good picture quality, although any smartphone will be able to deliver similar quality. It does offer better pictures than most smartphones, don’t worry, but we won’t be focusing too much on pictures. Using WiFi, you have access, through an iOS and Android compatible app, that’s free on Google Play and on the App Store, to all of your previous recordings using just your smartphone. The wrist-mounted remote will give you a lot of utility, as this model doesn’t come with a touch-screen. The 2-inch LCD display gives you plenty of brightness, but be careful, as it’s pretty frail and might break easily. Try using it with the waterproof case that comes in the bundle and remove the plastic cover from the lens for a better, clearer image (but don’t forget to put it back on if you plan on filming underwater). Although the 1050mAh battery doesn’t have an outstanding life, you do get two, so you should have no problem in filming extended footage. All of the images and videos are stored onto a microSD card, which you have to purchase and install separately. You also have to purchase a charger, although if you have a smartphone, you probably already have one and should have no problem, as the USB is included in the bundle. All in all, if you’re looking for an affordable camera that will deliver 1080p @ 60fps recordings, this is one of the best choices for its price range. 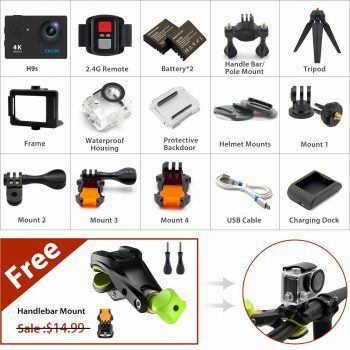 For the mere USD 63.19 you’ll be spending when using the “ZO3HRXV9” coupon code, you’ll be getting a complete action camera bundle, with bicycle and helmet mounts, underwater case, tripod and more, which films at Full HD quality with no issues – a very good deal for a starting kit. The only real drawback of this device is the sound quality which is unusable for entertainment purposes. If you think that you can cope with that, then this is a great choice. A little bit of editing can go a long way, as most of the montages present on social media are stripped of their original sound, replacing it with dynamic, engaging tunes. The H9S will replace the H9 in my best action camera under $100, so make sure you have a look at that list as well.